There are many iconic things that represent the lifestyle of Northern Michigan—sipping a glass of local wine outdoors on a cool night, an evening walk on the beaches of Lake Michigan, or a leisurely breakfast on the back porch of your cottage. But perhaps nothing is more representative of this area than Leland Blue. Find Leland Blue jewelry on ShopMyNorth.com. From 1870 to 1885, Leland was a smog-filled industrial town anchored by the Leland Lake Superior Iron Company. After the smelting industry failed because of large overhead costs and the lack of a good harbor in Leland, the remains of the industry, including heaps of slag, were dumped into the harbor. Slag is a byproduct of the smelting process: raw ore is heated, and the desired iron ore is separated from various natural impurities. When those impurities cool, the result is stone-like slag. 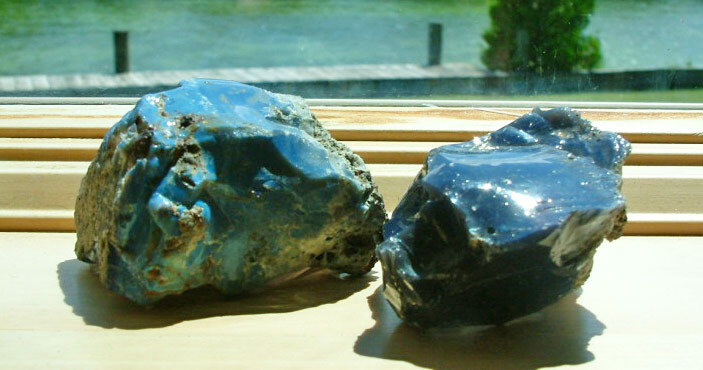 Leland Blue, specifically, is the mix of blue glass with other chemicals, but this varying chemical medley can also cause the slag to appear purple, gray, or a shade of green. Today, people find this slag material on the shores of Leland’s beaches. For many locals, Leland Blue has become much more than a waste product. Leland Blue has become the industry itself. More than just a quintessentially Northern Michigan stone, Leland Blue is the foundation of a whole lifestyle that has seamlessly blended the business of selling with the love of finding and working with it. 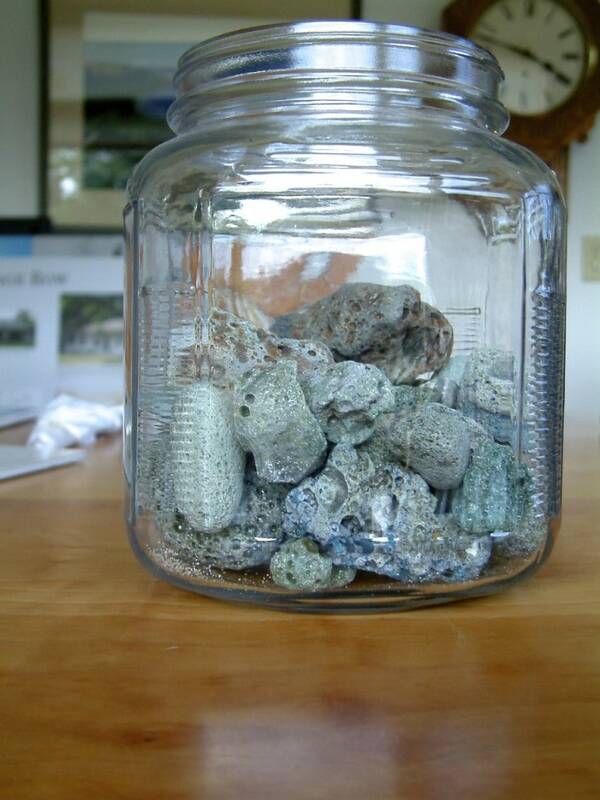 Karen Maas, a native of Northern Michigan, has been collecting Leland Blue for years now. I meet Karen for the first time at Vans Beach in Leland. 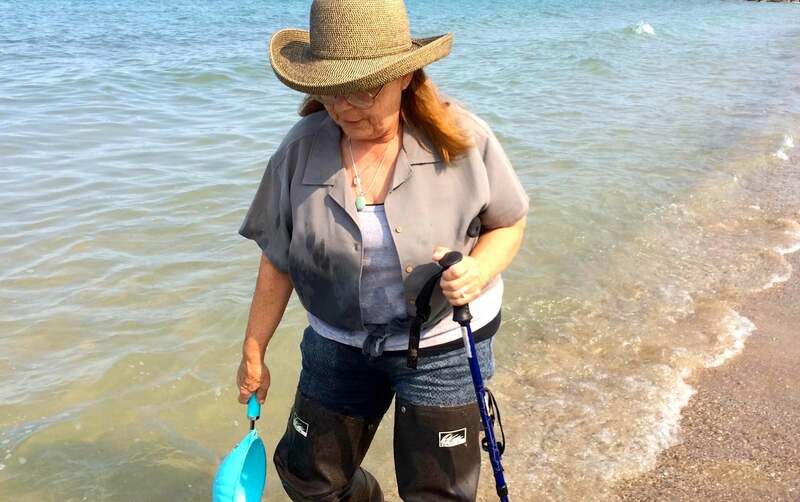 She’s wearing blue patterned jeans, a gray short-sleeve button-up, thigh-high rubber boots, and a straw hat—her standard uniform for beach combing. While it started off as a way for Karen to focus her energy and get in some light exercise, it soon developed into what she calls her “addiction.” Karen comes to the beach almost every day in the off-season to look for the stone. “I love coming in the wintertime when it’s just the locals. In the summertime, we have so much more traffic on the beach, that you just don’t get the fortuitous ‘Oh look! '” she says as she looks down and out into the water. Karen does this often. Her eyes are constantly fixated on the shoreline. As she talks, she rarely looks up. Her tools are ready in her right hand, and her walking stick is held firmly in her left. Karen Maas holds a blue strainer in her right hand and a walking stick in her left. “I don’t pay attention to other people out here. I like it best when it’s just me. From October to April, it’s just me and the lake and a few other nutcases (artists) like me. When you need a place for your brain to get quiet, this is a good one,” she says with a laugh. While we’re on the beach, we meet another like Karen, who Karen connects with instantly. His name is Randy Sias. Randy lives and works in Cincinnati but has been traveling up to Northern Michigan in the summer to collect beach stones to make birdhouses and frames that he sells at local art fairs. Karen talks with Randy about the differences of looking for stones in and off season. “In September, you can be walking on rocks all the way out. Once, I found a huge chunk but it was this [motions with hands to her chest] deep and it was way cold and I couldn’t get it without putting my head under. So I said I’ll wait until summer and I’ll be able to go out and get it, but as soon it gets warm that layer of rock is gone,” she says. Karen is self-deprecating about her obsession with the stone, but she has also found a way to use her obsession for the benefit of her friend Becky Thatcher, of Becky Thatcher Designs. Becky Thatcher is a jewelry designer who owns Becky Thatcher Designs with locations in Glen Arbor, Harbor Springs, Leland, and Traverse City. Becky wears a white, loose sweater with a Leland Blue necklace. She’s warm, relaxed, and clearly very passionate about her work and the stones of Northern Michigan. She takes pride in her jewelry, but she’s also candid about the challenges of working with Leland Blue. “I realized there was the opportunity to establish a tribal jewelry. I felt like people were looking for something that would give them a connection to the area. 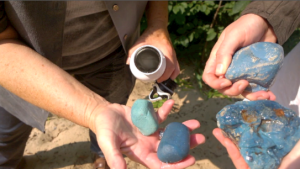 While I had been doing that with other materials—like stones that I thought captured the color of the water and the textures of the sand—Leland Blue was an obvious choice,” she says. Becky Thatcher, wearing one of her own designs with Leland Blue. However, the stone can be quite porous, dull, and difficult to work with. “[Leland Blue] fractures easily, and each group is a little bit different. You always want more of a different color but you can’t get it. You just have what came that day or what you’re able to unearth in buckets. That’s the toughest thing, if you find a beautiful color, it can be very limited,” she says. Not only is Leland Blue difficult to work with as a stone, it’s difficult for Becky to find stonecutters that can send her material on a regular basis. Many of these cutters work with Leland Blue as a hobby, not a career. Leland Blue stones also have a very wide range of colors and shapes, the name being a bit misleading. There’s a huge variation in stones, from shades of green, purple, and gray to the more traditional blue stones that are often pitted from air bubbles. Becky, pointing to her own necklace—a strand of Leland Blue stones all about the same color and size—says she doesn’t think there will be many more pieces like this. Both Karen and Becky realize, however, that these imperfections are what can add beauty to these stones. With such a range in color and overall texture, Becky has found that embracing these imperfections makes for unique pieces. 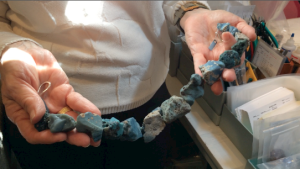 “The fractured pieces actually have a more organic feel and then you mix that with the industrial material,” Becky says, as she holds a necklace with large, roughly cut Leland Blue stones, pictured below. One of Becky Thatcher’s favorite Leland Blue designs, which features large, fractured stones. Becky also likes using a mix of different shades of Leland Blue and a stone called the Glen Arbor Pierced Stone to create a more casual look. The mix of roughly cut, mismatched stones reminds her of walking the beach looking for rocks. Karen and Becky have a singular appreciation for the stone that’s reflected in their work. And while their work is very different, they both are looking for stones that tell a story. These stones have a deeper meaning that goes beyond Leland’s history. They bring to mind perfect days by the water and connections to the natural landscape. Becky can look at these stones and see brush swirls similar to those found in great works of art. “[This stone] reminds me of some of Van Gogh’s skies. He used this same color. It’s a little more linear where he would have broken it up in small brush strokes. It’s a mix of one of his daytime skies and ‘Starry Night’ with the blending of the colors and the swirling that takes place there,” she says, as she holds the stone in her hands. Becky could find some sort of beauty in almost every stone she looks at—whether it reminds her of a famous painting or a walk on the beach. “Sometimes you have one of those beautiful days that you just want to remember forever, and I hope that this captures it and helps [the customer] relive that day until they make it up [to Northern Michigan] again,” she says. Karen, as she shows me a small sampling of her collection of Leland Blue stones at Vans Beach, recalls specific moments in her life when she found a particular stone. “This is the one that just rolled up on my toe. It flipped me out so much!” she says, as she pours water over the stone to show me how it glistens in the sunlight. Karen Maas’ favorite stone that rolled up onto her toe, pictured center. Karen has her own personal health reasons for taking daily walks on the beach. But for Becky, this is her job. She has to find beauty in stones so that she has pride in what she sells to her customers. I get the sense that this goes beyond a business or even an obsession. Finding and working with Leland Blue is very much a way of life for Karen, Becky, and countless other people who live and vacation in the Leland area. Sometimes, that comes as a detriment to the business. People who collect the stone, the cutters, and even some of the designers do this as a side job. It can be difficult to have enough material to work with to sell pieces on a regular basis. But maybe that’s what makes Leland Blue so special. The people who work with Leland Blue do it on their own time, because they love it. 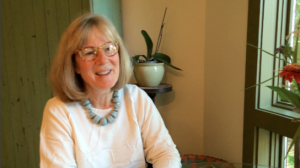 Karen found that Leland Blue could help her recover both physically and mentally from a serious car accident. Both Karen and Becky use Leland Blue as a means to remember specific times in their lives. This stone—once a waste product from a failed industry—now defines many poignant moments for the people of Leland. A clock that was used by the Leland Lake Superior Iron Company is one of the few remaining objects from the iron works. A kerosene latern which is said to have marked the end of the Leland Iron Works dock. A very porous Leland Blue stone. The front of Becky Thatcher's store in Glen Arbor. A Leland Blue stone that Becky finds reminiscent of Van Gogh's "Starry Night," surrounded by one of her necklaces. Browse Leland Blue jewelry at ShopMyNorth.com.